Home Hotels New South Wales Mercure Sydney Nautilus Resort Queensland Binna Burra Lodge Kondari Resort Lady Elliot Rydges Capricorn Daydream Island Castaways Rydges Reef Resort Palm Royale Red Centre The Lost Camel Kings Canyon Resort Red Centre resort Glen Helen Homestead Territory Inn Tasmania The Lodge on Elisabeth Top End El Dorado Motor Inn Mercure Inn Katherine Gagudju Lodge Cooinda Kakadu resort Frontier Darwin Victoria Bothfeet Lodge Batmans Hill Like a bunch of other resorts, the Lost Camel lies within eyesight of Uluru. Uluru lies in the middle of nowhere, even for Australian terms. 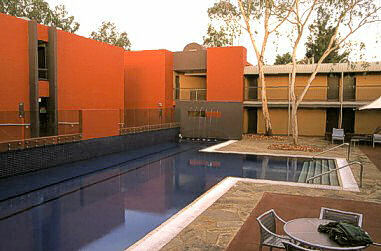 And the whole hotel complex, the Yulara resort, is run by the same company. So after calculating the costs, the managers would sit at the table waiting for some inspiration what apart from the costs and normal profit they should charge. No competitor will be able to keep their dreams limited. Indeed the hotel isn't bad, but do not expect it to compeat with any hotel of the same price anywhere in the world. Talking of us, our guide informed us, the hotel was not prepared to serve breakfast for a group of 9 people we were. But maybe the tour operator wasn't ready to pay the price, who knows. Anyway we had to drive to breakfast in another hotel and it was long enough to do it by bus.